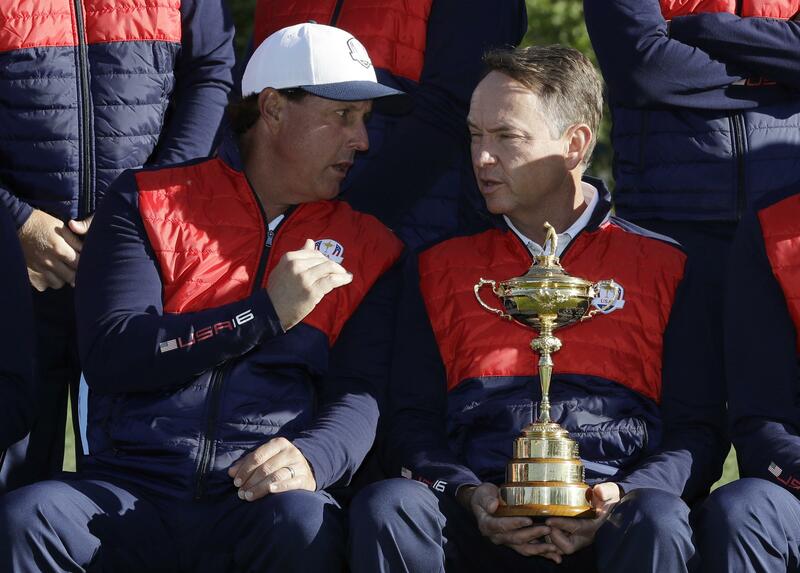 Tue., Sept. 27, 2016, 6:45 p.m.
CHASKA, Minn. – Davis Love III said he was only trying to illustrate why his U.S. team should play with more swagger in the Ryder Cup. His comments wound up providing plenty of fodder for the Europeans, and perhaps a little extra motivation they didn’t even need. That’s what Love said in a radio interview last week. Rory McIlroy seized on it last weekend, joking that the Americans at least had the best Ryder Cup Task Force ever assembled. He couldn’t help but mention it again on Tuesday before the first practice session at Hazeltine. “Whenever we are going up against one of the greatest teams ever assembled, that’s motivation enough,” McIlroy said. Adding to the bulletin-board material was NBC Sports analyst Johnny Miller saying Europe had the worst team he had seen in years, particularly with six rookies. Europe has won eight of the last 10 times in the Ryder Cup dating to 1995, and while there are six players who have never experienced the emotions and pressure of the Ryder Cup, only four Europeans on the team know the feeling of losing. Love said the conversation on SiriusXM Radio last Friday was “misconstrued.” He said a Canadian caller had said the Americans needed to play with more swagger, and Love agreed with him. He said the host asked what he would tell his team. “And I said: ‘I would tell my team they’re the best team ever assembled. Let’s go out and show off and play and have fun,’ ” Love said. It didn’t quite come out that way. European captain Darren Clarke said he didn’t need to post anything on the walls of the team room. His players heard the comment, some of them laughed about it, none appear to have forgotten. Clarke seemed more defensive about Miller’s comments. Based on the how Europe practiced on Tuesday, it appears that Clarke is blending experience with rookies. He had Martin Kaymer and Lee Westwood with rookies Rafa Cabrera Bello and Willett; Stenson and Rose with rookies Matt Fitzpatrick and Thomas Pieters; and McIlroy and Garcia with rookies Chris Wood and Andy Sullivan. The Americans are back to their “pod” system that Paul Azinger used in a rare victory in 2008 and Love modified in 2012. Jordan Spieth, Patrick Reed, Dustin Johnson and Matt Kuchar were in one group; Phil Mickelson, Zach Johnson, Rickie Fowler and Jimmy Walker were in another. Both groups featured previous partnerships. The last group included the lone rookies – Ryan Moore and Brooks Koepka – with J.B. Holmes and Brandt Snedeker. Neither side really needs any motivation, though Spieth suggested the most powerful type. “We’re tired of being told we haven’t won,” he said. Love said he brought Michael Phelps, the most decorated Olympian in history, to speak to his team on Monday night. Clarke countered with Paul O’Connell, the recently retired Irish rugby star. The message Clarke wants to deliver this week is for Europe to stand shoulder to shoulder. Love had the Americans on the verge of victory at Medinah, leading 10-6 going into the final session until they were overwhelmed by Europe and lost again. Only five players were on that 2012 team – Mickelson, Dustin Johnson, Zach Johnson, Snedeker and Kuchar. Best ever assembled? He won’t know that until someone is holding the gold cup on Sunday. Published: Sept. 27, 2016, 6:45 p.m.